CRAZY COOL GROOVY!!! : PATRIOTS DEFEAT JAGUARS To WIN 2018 AFC CHAMPIONSHIP!!! 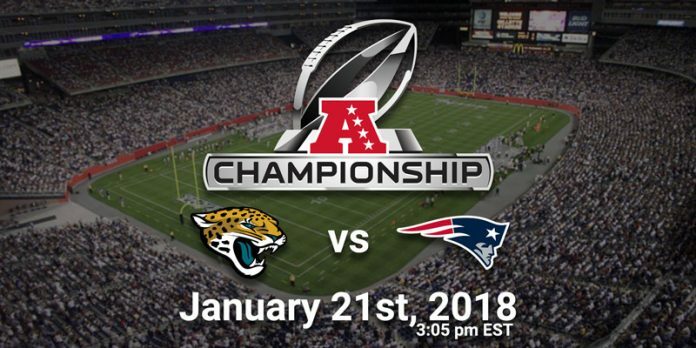 PATRIOTS DEFEAT JAGUARS To WIN 2018 AFC CHAMPIONSHIP!!! CRAZY COOL GROOVY CONGRATULATIONS to Head Coach BILL BELICHICK and the NEW ENGLAND PATRIOTS for Sunday, January 21, defeating the JACKSONVILLE JAGUARS 24- 20 at GILLETTE STADIUM in FOXBOROUGH, MASS, to win the NFL 2018 AFC CHAMPIONSHIP!!! The PATRIOTS now advance to face the 2018 NFC Champion PHILADELPHIA EAGLES at SUPER BOWL LII.